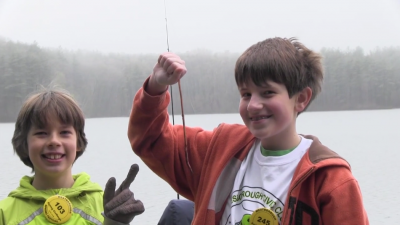 Last weekend’s dreary weather turned out to be perfect for the Civic Club’s 9th annual Fishing Challenge held on Sandra Pond at Minuteman Park on Upton Road. Dozens of families showed up to participate in this great day of fishing fun. Registration was free, and included a chance to win prizes in each of three age categories for the longest fish caught. Some participants brought their own fishing rods and tackle but equipment was also provided for anyone needing it. As always, worms were available as bait.